After selling for eight years without formal training, yet still attaining the position of No 1 salesman for my company, I purchased ‘Over 50 Ways of Closing the Sale’ around 2 months ago. To my surprise, I now close twice as many calls; make fewer call-backs; close calls I would have given up on previously; have just topped the one category which was formerly elusive to me, and not focus far better on the task at hand. If only I had ready books book 8 years ago, and attended his Evening Sales Workshop since!! What Peter has taught me has changed my selling and Business life forever!! I was the best salesman in the company before I met Peter Collins. But since attending two of Peter Collins Sales Seminars and a few Workshops since, and more recently an Advanced Sales Seminar, my sales have increased leaps and bounds. I was the best salesman in the company before I met Peter Collins, but I now close twice as many Calls, make fewer Call Backs, Close the Calls I didn’t before and Focus Better. Do I recommend what Peter Collins has on offer? You better believe I do. In July, I came to a Profit Maker Sales seminar conducted by Peter Collins and it really did change my selling – and it changed my life. The information I received was so powerful and my mind was racing so much. I wasn’t able to sleep very well the first night, probably worst, I wasn’t able to sleep well the next few nights as well. By business increased almost immediately, and all I can say is that you know you are dealing with positive people when you deal with Profit Maker and I am looking forward to how my future evolves. Over the past 30 years and a Sales Manager I have witnessed much in the way of Business Concepts, Sales Techniques and Advanced Sales Training. However I must say that Peter’s Ideas and Applications are among the Best I have ever seen. There is much Peter has to offer to those that take on board what he has to offer. I recently used Peter Collins as a Business and Media Consultant to my Building and Renovation business. Peter’s ideas on Quoting and Asking for the Order are among the best I have ever seen and used> Recommend him highly. 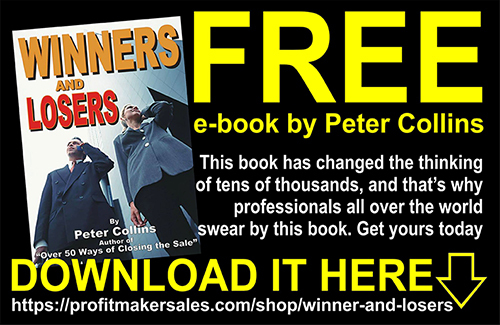 I have known Peter Collins for 9 years and have seen him mould many salespeople into Ultimate Selling Machines. I personally recommend him as a Sales Presentation Developer, Sales Trainer, Sales Coach and Sales Mentor. He is the complete package and I have seen him single handedly turn a business around keep it moving forward. He personally every Australian Sales Record in Australia and many International Sales Records. In fact he was that good he was inducted into the International Hall of Fame. The first time I met Peter Collins attending one of his Winning Edge Sales Seminars changed my life. In the first few weeks I found my sales increased selling wholesale sound systems from 50-100%. I also found myself much more positive and more focused as a result of the things I have learned from him. I’ve also learned to take control of my own life, rather than allowing others to control it for me, which I’ve certainly found helpful in my last situation. As a result of that, my belief system has also changed. Since then my sales have continued to increase and in the past three months the results have been better than I had written in the previous eight month period. I went to Profit Maker seminar just eight weeks ago and I can not believe the difference this involvement has made to me. I’ve had a whole change of attitude about a lot of things, a new focus, and I feel better about myself and things that I’ve learned and imparted to my people and I’ve seen sales go through the roof. Three weeks ago I came to a Peter Collins Sales seminar and that was probably the most exciting night of my life. It blew my brain. It blew my mind. I went home, I couldn’t sleep; I was up until about 3 o’clock in the morning and my mind was racing just thinking about potential opportunities and things I had never seen before. Basically, as a result of three weeks ago, I can’t sleep like I used to. It’s just an exciting and incredible experience.